Residents of the Santa Cruz community gathered at the Santa Cruz High Theater on April 10 to discuss the importance of a needle exchange. Photo by Daniela Ruiz. After a string of violent crimes and the shooting of two police officers in February, public safety has become the most hotly debated issue in Santa Cruz. In the latest installment of that discussion, local churches and nonprofits held a forum to address drug usage in the city. On April 10, more than 100 locals gathered at the Santa Cruz High School Theater to learn more about needle exchange programs and homelessness at the Drugs, Public Health and Needle Exchange forum. The meeting was one of a three-part series called “Santa Cruz Forums on Safety and Compassion,” which aims to address public safety concerns in a compassionate and nonjudgmental environment, according to a member of the Resource Center for Nonviolence (RCNV). 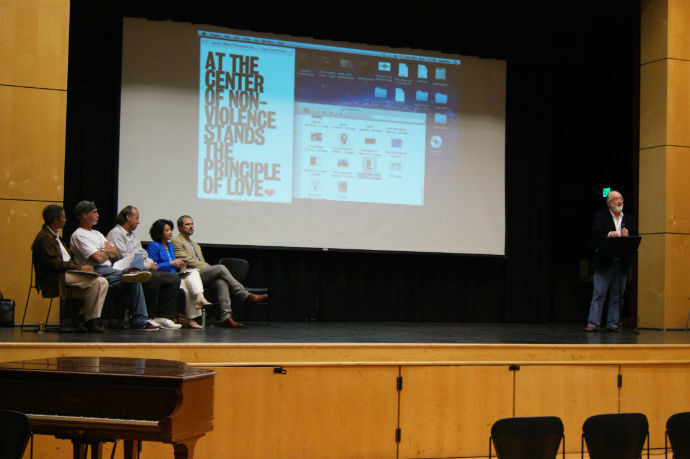 The forum was sponsored by the RCNV as well as other local groups including The Circle Church, Community Action Board, Homeless Services Center and several other Santa Cruz organizations. At the forum, a panel of experts discussed the benefits of needle exchange programs and addressed drugs and homelessness — topics that some on the panel said had received an unwarranted amount of negative attention lately. The city council’s closure in January of a local syringe exchange was another major issue discussed at the forum. Run out of a van by the volunteer group Street Outreach Supporters (SOS), the exchange operated on lower Ocean Street for 30 years before the owner of the property agreed, at the city’s behest, to prohibit SOS from continuing their operations. SOS has since relocated their operations to the county health facility on Emeline Avenue, a move that’s caused a 38 percent reduction in the number of participants who use the site. Needle exchanges dispose of dirty needles and give out sterile needles in return. Alex Kral, director of the Urban Health Program in San Francisco, said needle exchange services can combat pollution in the environment and help prevent the spread of HIV among intravenous drug users. In a study conducted by Kral and his colleagues, 3 million needles were handed out through a syringe exchange program (SEP) in San Francisco. The amount of needles improperly disposed of there was compared to Miami — a city with no SEPs — where no new needles were handed out. The study showed that 13 percent of needles in San Francisco were improperly disposed of, compared to Miami’s improper disposal rate of 95 percent. A multi-pronged approach is exactly what Giang Nguyen of the county Health Services Agency described in her presentation, which outlined the county’s plans to overhaul the syringe exchange program and related programs. The plan will move the exchange at the health facility on Emeline Avenue indoors and create new needle exchanges in the county. Nguyen said she intends for those efforts to be accompanied by additional outreach and educational programs. At the end of the night, the forum’s organizers said they hoped those who attended left with a better understanding of some of the issues influencing the public safety debate in Santa Cruz. Kral said he hopes that information provides perspective in a discussion that’s grown increasingly heated recently.